The encyclopedia states that Divine is probably best remembered as a man who, 'in his own peculiar way, acted in his own interest while skillfully advancing the cause of thousands of inner-city African-Americans.' To some he was God, not just a god—God! This shocking pronouncement brought mixed and sometimes violent reactions from others. But nevertheless he provided 'tangible economic benefits for thousands of disciples in the midst of the Great Depression.' To officials in Valdosta, Ga., Devine’s being thought of as God resulted in his arrest and eventual expulsion from the state. In 1935, three Newark followers trapped in an apartment house fire rejected the help of a nearby fireman as he tried to pull them to safety, shouting instead 'Peace, peace, it is truly wonderful. Father, Father, peace, Father, you will save us. Father, you are God, Father. Father Divine is God, God, God.' The next minute the trio disappeared in the all-consuming blaze, and the victims dropped from sight. Not much is known about Baker before his religious conversion other than that he was born to a sea island Georgia sharecropper shortly after the Civil War. By 1899 the 5-foot-tall 'Father' or 'God' Divine had moved to Baltimore where he worked as a part-time gardener and a sometime minister. Between 1906 and 1914, he made several crusades to Georgia and was arrested when he claimed to be God. Each time bail was posted by a local writer who admired him and his style. Some of his contemporaries considered him an imposter, or even a lunatic. Nevertheless, they continued to admire him as a powerful force for social change. Simply put, he provided 'tangible economic benefits for thousands.' In 1906, between trips to the South, Divine became associated with revivalist Samuel Morris, who had claimed that he was God. Morris’ claim was based upon St. Paul’s First Letter to the Corinthians that said 'Know ye that the spirit of God dwelleth in you.' Divine, who was spelling his name Devine at the time, became one of the staunchest disciples of Morris, who called himself 'Father Jehovia.' Divine adapted the title 'The Messenger.' During that time Divine began his claim of deity status and began using the term God. Father Divine’s main career began when he moved to the Northeast, leaving future crusades in the South for others. In 1915, he settled in Brooklyn. Sayville, L.I., soon became his next home. There he purchased a comfortable suburban house, married his first wife, Pinninnah, and began preaching sermons, confining the tone of his messages to salvation. His prior emphasis was on social equality. About this time he began to adopt the principle of the Last Supper and the feeding of multitudes at a generous supper table. The 15-cent supper, in a time of financial hardship and stress, brought hundreds to his dinner table. Because so many people began showing up at the suburban mission he called 'heaven,' local authorities became concerned and tensions began to rise. During the work week, Father Divine operated an employment agency, providing help for summer residents of the community. On Sundays, he provided workers with both bodily nourishment and spiritual sustenance. Divine’s philosophy was easy to understand. Basically, he approved of communal living, shared income, and a life of chastity and abstinence. He preached a doctrine of God that was within each individual. He argued for hard work, honesty, economic security, old-fashioned thrift, and the payment of purchases strictly with cash. Even real estate transactions were handled by the transfer of hard cash. Money was never to be borrowed, and racial discrimination was not tolerated. Once when Brother Lamb, a financial secretary to Father Divine, was questioned by the FBI about the church’s finances, he responded 'We have no books, bank accounts of any kind and everything we buy is paid for in cash. For example, if the father wants to purchase a building, he buys its mortgage for cash.' 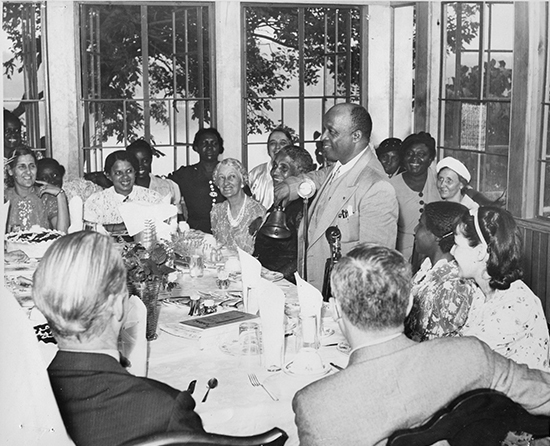 Father Divine’s devotion to feeding the hungry with fine food appears throughout accounts of his story regardless of whether it was in his New York, New Jersey, Ohio or California missions. In April 1935, the Newark Evening News described a banquet attended by Father Divine where there were 'baskets of fruit and candy everywhere. More than 500 men, women and children were seated at the table and at least that many stood around the perimeter. From the audience a woman shouted, 'Oh father, our Saviour, I love you.' Father Divine sat in a satin-backed chair at the head of the banquet table. Every course passed through his hands.' When Father Divine or Mother Divine were not present at a banquet, a table setting was laid in their honor, for they were there at least in spirit. The menu on that particular night was listed as free. Photographs of Father and Mother Divine decorated the room and statements from the couple were pinned to the tablecloth and attached to the walls. If you were hungry, there was plenty to eat. The meal that night included rice, baked hominy, mashed potatoes, spinach, creamed cauliflower, squash, string beans, sweet potatoes and asparagus tips. Ham and eggs, tongue, pork trotters (pig legs), pork listeners (pigs ears), pork wigglers (pigs ears), hot sausages, beef stew, fricassee chicken, turkey, and roast beef. Brown, white and raisin bread and pumpkin pie were also offered. The Newark Evening News article stressed that the food was free to all who would follow him. No one was allowed to pay a cent. While Father ate his ham and eggs, converts from all parts of the hall rose to testify in his behalf. In the mid-1930s, Divine moved his operation to Harlem. 'Heaven No. 1,' as the headquarters was known, was purchased in 1935 at 20 West 115th St., a 3-story red brick building. Other 'heavens' were in Los Angeles, Santa Cruz, San Jose and Long Beach, Calif., and new missions had sprung up in Colorado Springs, Pittsburgh, Philadelphia, Columbus, Ohio, Cleveland and Cincinnati. Soon, a 500-acre estate was purchased in New York’s Hyde Park opposite the Roosevelt estate. Additional farmland was acquired in upstate New York along with a large country club. Interestingly enough, real estate was never bought in the name of the sect’s leader, only by disciples, who were known as 'angels,' who lived at or were identified with the local 'heavens.' Through the 1930s, Father Divine’s success in the New York/Newark metropolitan area was enough to boggle the mind. There were 27 branches feeding between 2,000 and 2,500 daily. When asked how he supported such a movement, Divine said, 'The spirit of the consciousness or the principle of God is the source of all supply and will satisfy every desire. I have the keys to the pleasure of the earth. I have all the money I need.' Divine’s claim of supernatural powers and penchant for feeding the hungry has been likened by his advocates to Christ’s work. While the Internal Revenue Service looked into his operations and found nothing out of order, others have suggested the turnover of private property, life insurance policies, and personal savings as the base of his finances was unscrupulous. The 1930s were not all smooth sailing for the increasingly popular religious leader. They were years marked by lawsuits, a municipal investigation and the death of his wife. At one point, 'Faithful Mary,' a former angel, went into court in a property dispute with Divine for some of the heaven’s farms, dress shops, restaurants and the High Falls, N.Y., hotel she held for the church mission. Her sworn testimony claimed, 'He ain’t god, he’s just a damned man. He ain’t no more God than you’re a god.' Her fear that Divine was going to drop her by putting her back in the kitchen and not letting her sit with him at the great banquets probably brought about the dispute. Four years earlier John F. Selkridge, Divine’s manager of the Newark Wickliffe and School Street 'heaven' was arrested because the operation was creating a public nuisance by making too much noise and Selkridge was taken to the Fourth Precinct, where he was booked and then released. The same year Father Divine was sued by an irate husband who claimed he lost the affections of his wife and 14-year daughter to the church. But a municipal investigation by Judge Hartshorne of Newark’s Common Pleas Court found nothing illegal. Because of increasing legal problems in New York and the spread of the organization to different parts of the country, Divine eventually moved his operations to Philadelphia, where he purchased a large mansion. During World War II, Newark briefly became the center of his operations. Nearly a half-dozen facilities were opened here to support his local activities. The most important was the purchase of a large downtown hotel. One of Father Divine’s earliest holdings was on Avenue C. It produced considerable revenue for the city in 1937. Later, the activities housed there were moved to a more accessible location on Mulberry Street. Divine’s Howard Street building, earlier a city bathhouse, was home base for the organization’s parent offices when it was banished from New York City. A Forest Hill mansion at 60 Abington Ave. also was acquired. The aformentioned old cigar factory at Wickliffe and School streets was one of the earlier 'heavens.' Another prominent holding was a former hospital on Central Avenue. Father Divine never owned the buildings. They were entrusted to angels. While this was a good solution for tax purposes, it caused legal problems when an angel decided to leave or refused to return a deed being held for the community. The Riviera Hotel at High Street and Clinton Avenue was the organization’s most valuable Newark property. It was bought in October 1949 for $500,000 cash. Ten men arrived at Newark’s Federal Trust Co. carrying suitcases filled with $5, $10 and $20 bills. They had come, unguarded, on a regular train from Philadelphia. For three hours and 30 minutes, 14 tellers and 10 checkers counted out the money for the transfer of the eight-story, 250-room brick-and-limestone hotel—one of the strangest transactions in the city’s banking history. With the deed transferred to the new owner, many of the original and longtime employees left. A few, including the chefs and the maintenance staff, were retained. The bar was immediately closed, and all cigarette machines were removed. Communal living was strictly enforced with men and children living on the lower floors and women given rooms on the upper floors. Children were treated as brothers and sisters and married couples were separated. The only initial renovations were in the dining room, which became a focal point in the members’ religious and social life. The Sunday dinners continued, but the 15-cent price of previous years was increased. Although Father Divine was extremely active in his earlier years in the South, in Baltimore and subsequently in the New York City and Philadelphia, he was in Newark frequently in his later years. During the early 1940s, the city served briefly as the headquarters for all his activities. In 1936, the Newark Evening News covered an event and parade, which attracted 5,000 people to Newark Kingdom No. 1 at School and Wickliffe streets. Divine toured the area in his Rolls Royce, which was decorated with stuffed peace doves. Truckloads of vegetables including corn, pumpkin and melons followed. On one truck there were tables loaded with candied hams and sweet potatoes. An elaborate dinner was planned in the packed auditorium, and the air was filled with emotion and happiness. At the time of the parade it was estimated that Father Divine had attracted a following in Newark of 10,000, and at least 15,000 in Essex County. On October 23, 1949, Father Divine made a surprise visit to the Riviera to inspect this latest acquisition by his followers and stressed 'there will be absolutely no mixing of the sexes, and ladies and gentlemen will be accommodated on separate floors.' In addition, the leader of the International Peace Mission Movement 'declared it is likely that in accord with his teaching, the fire insurance on the building will be dropped.' No tipping was allowed and drinking and smoking in the building were banned. Weekly rates for rooms were $2.50. Guests could stay only if they agreed to follow his rules. Divine was accompanied by Mother Divine, and others prominent in the movement. He was described in a news account as 'nattily attired in a blue suit, white waistcoat with pearl buttons, gray, blue and red tie, and wore a red rose in his lapel. There was a gold watch chain across his waistcoat. The lobby was jammed with his followers, guests of the hotel, employees and the merely curious.' With the outbreak of World War II, the emergence of local prosperity and wartime employment, the idea of frugal collective living lost much of the appeal it had during the Depression. Nevertheless, the movement remained an active force, both in Newark and other communities. His second wife, Edna Rose Ritchings, was better known as Mother Divine. Highly regarded in the community, she did much to assist Father Divine during his later years when the two of them had retired to their 32-room home in Philadelphia. She is credited with keeping the movement alive during Divine’s final years when he was confined to his home. Mother Divine based her authority on the contention that 'Father did give me a position alongside of him that he has given to no other one.' Upon Divine’s death in May 1966, she noted, 'Father Divine is god to me. He has just gone away for a spell and he will come back to earth in bodily form, and not reincarnated.' At his death, Divine’s estimated wealth was $10 million.